Today we see various latest designer Georgette kurtis in women’s ethnic wear. Modern girls who always like to try various tops for them. The printed patterns offer uncountable choices in the current trend. Plain & jacquard fabrics are always in high demand. Plain fabric to produce embroidered & printed stylish Georgette kurtis. Self-patterned fabric (Weaving) is advisable for the different look. You will look different in crowded gatherings whether it may be a day or night. Viscose rayon is a natural thread. Georgette fabric constructed of viscose rayon is best in its category. The quality of the dress material is excellent for heavy embellishment. The fabric is strong enough to hold embroidery, mirror work (shisha patterns) & patchwork. Lets’ see some Georgette Chikankari kurtis patterns introduced in 2017. This type of kurtis became popular as a Lucknow kurti for its embroidery patterns. Georgette anarkali kurti patterns also entered in fashion for its shape. If you are Young Girl than go for stylish looking latest Georgette kurtas designs with rich work. These types of tops are in current fashion because of the semi-transparent fabrics. There are many types of embroidery work popular in India. Chikankari (“Chikan” sense for motifs & “Kari” sense for craft) is a most popular ancient type of needlepoint embellishment. It is also famous for Lucknow embroidery. Lucknow is a city once governed by Mughals, located in the U.P. state of India. Chikankari kurtis are in demand since it entered in embellishment. Colorful threads with vivid shades enhance glamour & look of the garment. Heavy work perfectly goes with this type of material, which is capable to hold the weight of work. This type of embroidery contains various motifs like creepers, peacock, parrots & other birds. Petals, grass leaves, leaf pattern, flowers, foliage, elephant & mango fruits patterns are also part of it. Nowadays trendy chiffon kurta with embroidery patterns are the solid fashion statement. Designer party-wear Georgette kurtis designs with different cut, shape, pattern & style are in vogue. Young girls are crazy for trendy looking long Georgette kurti top design. Various uncommon Georgette kurti neck designs are emerging in this fashion world. India is a hub of polyester yarn and viscose rayon. Installation of advanced weaving plants including pre-weaving preparatory. The quality of fabric has improved a lot due to advancement. Post weaving process is also advanced to match international quality standards. The quality of fabric in weaving has also improved. As usual, garment industries are also one step ahead in technology. 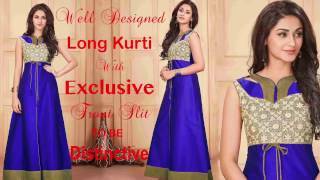 Many e-stores also offer kurtis online shopping at a discounted rate. It is very simple to buy online kurtis of reliable brands and designers. Buy online Georgette long kurtis from India at lowest price with newest & exclusive features. We produce & deal online in genuine latest Georgette kurti designs @ cheap price. Visit our e-shop designerandyou.com and compare products with other ordinary online stores. You will definitely find best products made out of best quality fabric. Embroidered kurtis with neck back collar & sleeves patterns are emerging in every woman’s taste. “V”, “U”, “C” Neck and Chinese collar have become the old story now. Today bold styles like drop, cut crop & one shoulder are in demand by teenagers. Sleeveless, cap sleeves, open back & backless kurtis are also in the rage. Visit designersandyou.com for party wear printed pure Georgette designer long anarkali kurtis patterns online. Women’s chiffon tops are basically made using various fabrics. Those are silk, polyester, cotton, viscose, rayon & nylon. Among these fabrics nylon, rayon and polyester materials are synthetic fibers. Cotton viscose and silk fabrics are the natural fibers. It was mainly used to make sari and salwar kameez in bygone days. There are many qualities compared to other fabrics that make chiffon more preferable to make ladies attire. Like for example, it can easily fold because of its slimness. It is easy to carry because of its least weight, in current fashion world designer frequently use this to make chiffon kurti design. Floral designs printed chiffon kurtis patterns & long Pakistani style kurtis are making of nylon chiffon. It is relatively easy to make the floral pattern on nylon chiffon. In comparison to other fabric the printing, the result of the final form of flowering print looks totally different. Due to the transparent characteristic print pattern in chiffon long kurtis looks pretty. It is also a cheaper fabric than other ones. There are three types of chiffon fabrics available in the market. Chiffon made with silk called silk chiffon, nylon chiffon and polyester chiffon. Going into the deep, we start with various designs and patterns. 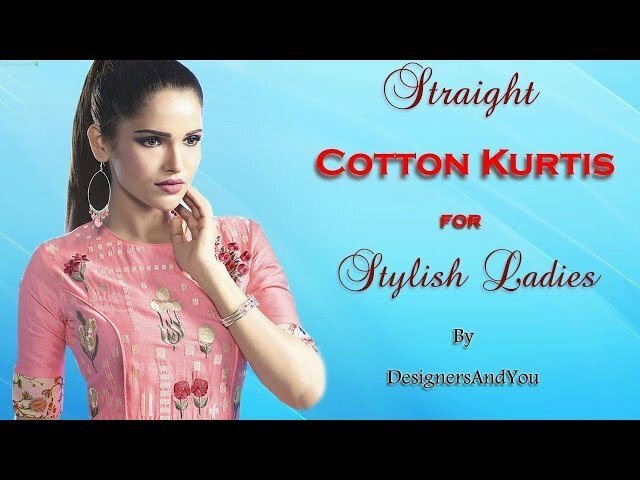 Designer chiffon kurta comes with either print or embroidery patterns. Ladies chiffon tops are very popular in modern women because of its comfort and shiny appearance. The printing of silk chiffon is difficult compared to nylon but you get a quite versatile look. Long chiffon kurtas are very much catching up with the trend. If you are fond of floral chiffon long tops than you will surely appreciate our efforts to cater most stylish and trendy ones. Chiffon Kurta tunics are suitable to wear with various type of bottom wear of your choice. Indian crepe kurtis deliver a great amount of drape, outstanding finishing with granular feel. Various types of crepe fabrics are available to produce exclusive crepe kurtas. Japan, French & American crepe are popular names of crepe fabrics. Today American crepe kurtis are in trend because it gives feeling and looks like silk. Famous French designer (Georgette De-La-Plante) invented georgette fabric in the 20th century. He was in search of a special type of fabric to make an evening gown. Later on, British introduced the fabric to India. As soon as introduced to produce sari blouse and salwar in the British era. Due to its dull finishing and less weight, it was introduced to produce another type of outfits. The root of the polyester georgette fabric's history points out towards French dressmaker. It is an invention of the Madame georgette de-la-plant. The basic idea behind this fabric came from chiffon fabric. This is the reason why polyester georgette is pretty like chiffon fabric. Georgette is a lightweight, sheer, crepe fabric with a quiet dull finish. Earlier silk was a raw material of georgette, now rayon & polyester are the raw material of faux georgette. It has the signature-puckered surface, which is due to alternate “S” and “Z” twist both warp and weft in yarns. Generally, the twists per meter are around 2000-3600. Original polyester georgette fabric is woven using crepe yarns. Twist before and after the texturizing process is the main process to produce crepe yarn. The extra process of twisting result is excellent finishing. The granular feel gives a great amount of drape to the fabric. Although high shrinking during the finishing process is the disadvantage. Solid color dyed & printed Georgette is the raw material of blouses, evening gowns & sarees. It is bouncy and hence it is popular for Indian wear. Georgette is a quiet strong fabric that makes it comfortable to wear. We can classify Georgette fabric on the base of raw material and weight. This is the most expensive one and is mostly used in heavy sarees and suits. The main advantage of being heavy, it can sustain heavy work and embroidery done on it. Ideally, Indian wedding saris and lehengas are made using this fabric. This cloth is lighter than 80 grams. And is ideally used for embroidery work, digital and normal prints. This is the most commonly used fabric. It is used in Georgette tops, kurtas, tunics & dresses with work, western wear for females, printed sarees and gowns. This is cheaper than 80 grams and 60 grams. Georgette fabric, woven in a satin pattern: These types of fabrics are best to wear in all seasons, during the hot or cold weather. We see such printed Georgette kurti kurta tunic & everywhere in the shopping center. Current scenario of high competition forces manufacturers to reduce cost. Producers of women’s tops always search cheaper alternative fabrics. They compromise on quality to match price cost. Georgette is made from various types of yarns such as viscose, silk, nylon & polyester filament & fiber yarn. The combination of different yarn in weaving has given a totally new type of fabrics. The result of this type of fabrics comes out with some unique feel, fall, hardness, roughness & dye pickup. The new and fresh look and feel give completely different material for garments. Georgette long kurtis designs in the UK are mainly designed for such type of fabric to get the best result of various prints and solid colors. Silk mix fabric is best for feel and fall (draping). Indian and Pakistani kurtis are made with these Georgette fabrics to get a silky appearance. The feel and fall make it different than other dress materials. Georgette is more opaque than chiffon so it can be used as sarees and Indian gowns without exposing the body. Georgette has a great amount of drape and hence it looks really good on a curvy body. Due to its bouncy effect, sarees and gowns look extraordinary produced from Georgette. Maintaining Georgette fabric is easier than chiffon fabric. Mostly Georgette is lightweight and thin so it is very commonly used as an overlay. In gulf countries, males use superfine fabric’s long scarf type handkerchiefs. White & black or red & white handkerchiefs protect their head against hot blow of 50 degree Celsius. It is also used in the making of kaftan dress for the USA. It is shimmery in appearance. (In simple words lustrous) It is airy. It is sheer in appearance. (In simple words semi-transparent) It has a great amount of drape. Sheer look with crispiness and lustrous feel are main characteristics of chiffon fabric. Lightweight is an extra plus point for its mass consumption. Women's of all age group like chiffon’s sarees, dupatta & scarves. Because of mix effect, ladies like chiffon tunic, dresses, suits, gowns. Crispiness and lustrous feel help them to put on chiffon’s products for 24 hours in any climate.